what if you were a Syrian in your thirties? I ask you this naïve question – but it’s really not a question. I ask so I can tell you how the past two and a half years have brought Syria – my country! – to a new turning point, from which we can’t go back. I know Syria is not strange for you, because you spent most of your life so close by. I know you know the color of our land, that you met Paul near our capital, Damascus. I do not bring this up because I am afraid of the future, or the consequences of war – anything external. I say these things to you because I want to be a Christian inside, not a part of a group that must survive. I want to live a Christian life, as one baptized to be priest, prophet and king – like you. I ask you these questions because I am lost and I cannot find answers that give me peace. Usually I want to be like you, but today – just today – I want to reverse this. How would you react if you were in my place? Today I want you to be like me, my Lord, while still being my Lord. I want it so you can guide me. So I will know how to live as a good Christian. It’s not that we are so dissimilar. What you experienced two thousands years ago, it was very similar to what I am living right now. I too was born under a dictatorship. Like so many Syrians, I too have dreamed about the day of freedom. Do you still remember when you were born under Herod? And the terror? Let me see this current situation as you saw yours. Grant me the gift to see in it not only tyranny, but also a call – like yours, like the one you felt – that encourages me to change this world. And your family, I am sure it faced problems when the blind bureaucracy demanded of Joseph and Mary a trip to Bethlehem to be registered. I know, too, what it is to face such a bureaucracy each day. All I want for my country is progress. Which is why today, as people around the world pray for peace in my land, I ask you to grant me – give us all – your gifts. So I will be patient and understand that everything takes time. But still, my Lord, can peace come sooner? And progress? I know you do not need an Internet connection to see the atrocities the world sees, the massacre of children and women. Surely it must be similar to what you heard – the stories of massacres in Jerusalem, like the one committed just after you, an incapable infant, had been born. I wonder if you felt trapped as you lay swaddled in the manger while the killing of innocents happened. I too feel trapped, like a constrained child who cannot yet talk. Today, I ask you to grant me your gift of freedom, the freedom to not respond to such violence with more violence. So I will be meek and not act in violence. Do you still remember the day, driven by the Holy Spirit, you left home for the wilderness? Didn’t Mary wish that you would stay? It seems impossible a good mother could want her son to leave – but Syrian mothers do these days, they prefer missing their sons and husbands. Better to see them safe, away from home, than in coffins. Today, I ask you to grant consolation to every bereaved mother, and to every mother far from her children. Give solace to each widow and all lovers. I am one of these far away sons, my Lord. I am far from home and so I feel the waiting in fear and the edgy panic of these days through my family and friends. Do the hiss and whine and the explosion of the missiles launched from one neighborhood to another sound like the thunder you knew? Do you know that the fear your disciples felt while you slept in the boat is only a shadow of the fear my friends and family feel at the sound of the bombs? Today, I ask you to grant us the gift of courage. So we will never feel insecure again – because we feel you beside us. Do you know, Jesus, that I have never carried any kind of weapon? I don’t even know how to use one. Which is why it is so strange that part of me wishes for someone, someone with powerful weapons, to intervene and deliver us from our misery. It was your Pope’s call for peace that brought a sliver of the desire for peace into my heart. And then I remembered that you refused to carry a weapon as well, even a stone to throw at a supposed sinner. Today, I ask you to grant me your gift of a peaceful heart. So I will call for peace, compromise, instead of the use of power. How quickly the chemical weapons killed so many children, innocents. The blink of an eye. My degree in chemistry won’t help me to describe for you what the poison gas smells like, or what a human feels when they are dying of it. But you know what it is to suffer and choke as you die. Today, I ask you to grant us the gift of compassion. So we can share the suffering and passion of those innocents. So many of my friends have left Syria, some before, some after this crisis. Why did you come back to Jerusalem? Hadn’t you noticed the success you’d had in Galilee and the Decapolis? Hadn’t you felt the happiness of sitting and eating with friends and strangers? Why did you leave that to go to Jerusalem when you knew what lay before you? Was it because you too learned to love Jerusalem only after you left? Today, I ask you to grant us your gift of fidelity. So that we too may wish to return home, to love Syria, again. I will tell you a secret today, Jesus, that I have never told to anybody before. Usually, you know, it isn’t proper for me to speak too much about the trespasses of your Church – but you never stayed mute about undesirable attitudes. And today the same cancer is still spreading. So with apologies I tell you that sometimes I am embarrassed by all the speeches about the suffering of Christians while the misery of our Muslim sisters and brothers is ignored. I am almost crazy with it sometimes. Today, I ask you to grant me your gift of merciful compassion. So I will love your Church in its trespasses – and remember that I too am a part of this Church and need forgiveness. I have one more question, Jesus: how did you forgive them as they crucified you? It’s what haunts me the most, the difficulty of forgiving those who have hurt me. I can’t find it; I have no logical explanation for how you could forgive them as they did it. When I look for one all I can remember is your call to follow you, and buried within that call is the instruction: forgive those who hurt you. So today, my Lord, I ask you for forgiveness. Forgive me and let me forgive my enemies. I am walking a thin line between hope and desperation, Jesus. I think it is the same feeling that was inside your disciples after your death. Like them I want my dream to come true, I want freedom, and for the blood of the 100,000 to not have been shed for nothing. I believe in your resurrection. So when I – when we – feel tempted to give up, when we want to stay buried in the tomb of slavery, come and rise in us then. Come rise in us so that we can cross Golgotha to the glory of resurrection. And trusting in your Father we Syrians, and those who pray with us today, can say: God, into your hands we commend our country. 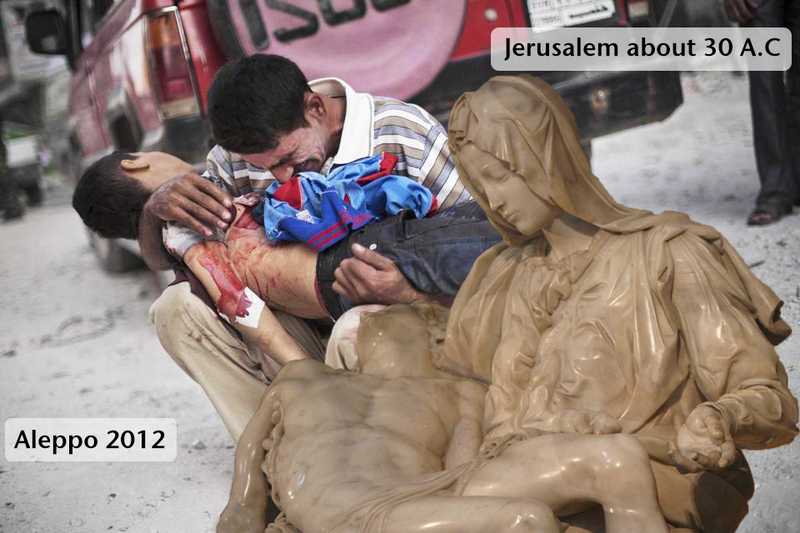 Oh my Jesus, bring your resurrection to Syria today. Tony is a Syrian Jesuit from the Middle East Province, he is 28 years old and is the webmaster for his Province’s website. After he graduated from University of Aleppo in Bio-chemistry department, he joined the Society, spending two years Cairo, Egypt, after which he studied philosophy and Arab Civilization in Beirut, Lebanon. He is currently a student at Creighton University in Omaha where he studies Digital Journalism and Computer Science. Besides studying, Tony spends time on photography translating to and from Arabic.